Spring has definitely sprung and I couldn’t be more happier! Naturally we all start to ‘Think Spring’ and what to wear for the warmer season ahead. Lucky for you I’ve rounded up the top five season’s best for you to incorporate into your wardrobe this season. With sporty and versatile as the watchwords for Spring/Summer, you will find tons of whites, sheers, clean lines and pastels. 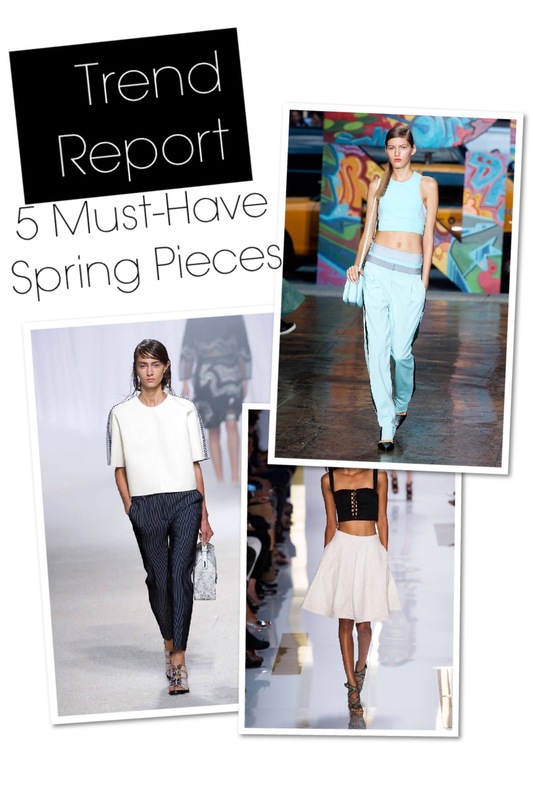 See some of my runway to street picks below to get you all excited for spring. Sporty has never looked this good! This sporty trend has definitely given the tomboy girls a high-five. But of course adding heels will definitely elevate this look from day to night. Put that pop in your sweater this season with a statement one that is! The bigger and bolder the print, the better so think ‘go hard or go home when it comes to this trend. If you thought full skirts were going anywhere, well think again! They are back and in full effect (pun intended). Pair yours this season with a cute crop top or keep it office friendly with a light sweater tucked in. My rule of thumb when wearing sheer is to keep your under garment the same colour for a cleaner look. Talk about a shift in your shirt right! Being a huge fan of these tops I cannot stress how well they pull your entire look together. Try it in a crisp white and mix and match it with all your bottoms (skirts, shorts, denim, pencils etc. ).